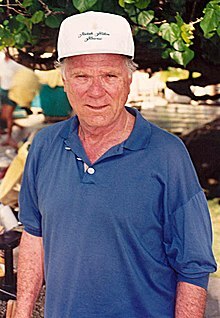 Jackie Cooper (nombre artistico de John Cooper, Jr.), naixito de Los Angeles (California) o 15 de setiembre de 1922 y muerto en Beverly Hills (California) o 3 de mayo de 2011, estíó un actor, director y productor cinematografico estatounitense, activo en o cine estatounitense dende zaguerías d'os anyos 1920 y con quantos premios recibitos mientres a suya carrera cinematografica. En 1931 Jackie Cooper fue nominato a o premio Oscar a o Millor Actor por o suyo papel en a cinta Skippy, de Norman Taurog, quan teneba nomás que 9 anyadas. 1929: Boxing Gloves, de Robert A. McGowan, con Johnny Aber, Norman Chaney y Joe Cobb. 1929: Bouncing Babies, de Robert A. McGowan, con Bobby Hutchins, Mary Ann Jackson y Allen Hoskins. 1929: Moan & Groan, Inc., de Robert A. McGowan, con Allen Hoskins, Mary Ann Jackson, Bobby Hutchins y Norman Chaney. 1929: Sunnyside Up, de David Butler, con Janet Gaynor, Charles Farrell y Marjorie White (no acreditato). 1930: Shivering Shakespeare, de Robert A. McGowan, con Norman Chaney, Allen Hoskins y Mary Ann Jackson. 1930: The First Seven Years, de Robert A. McGowan, con Bobby Hutchins, Mary Ann Jackson y Donald Haines. 1930: When the Wind Blows, de James W. Horne, con Betty Jane Beard, Chet Brandenburg y Norman Chaney. 1930: Bear Shooters, de Robert F. McGowan, con Leon Janney, Bobby Hutchins y Allen Hoskins. 1930: A Tough Winter, de Robert F. McGowan, con Allen Hoskins, Mary Ann Jackson y Bobby Hutchins. 1930: Pups Is Pups, de Robert F. McGowan, con Bobby Hutchins, Allen Hoskins y Norman Chaney. 1930: Teacher's Pet, de Robert F. McGowan, con Bobby Hutchins, Allen Hoskins y Norman Chaney. 1930: School's Out, de Robert F. McGowan, con Mary Ann Jackson, Allen Hoskins y Norman Chaney. 1930: Helping Grandma, de Robert F. McGowan, con Bobby Hutchins, Matthew Beard y Allen Hoskins. 1931: Love Business, de Robert F. McGowan, con Bobby Hutchins, Mary Ann Jackson y Norman Chaney. 1931: Skippy, de Norman Taurog, con Robert Coogan, Mitzi Green y Jackie Searl. 1931: Bargain Day, de Robert F. McGowan, con Matthew Beard, Bobby Hutchins y Shirley Jean Rickert. 1931: Young Donovan's Kid, de Fred Niblo, con Richard Dix, Marion Shilling, Frank Sheridan y Boris Karloff. 1931: The Champ, con Wallace Beery, Irene Rich y Roscoe Ates. 1931: Sooky, de Norman Taurog, con Robert Coogan, Jackie Searl y Willard Robertson. 1932: When a Fellow Needs a Friend, de Harry A. Pollard, con Charles Sale, Ralph Graves y Dorothy Peterson. 1932: Divorce in the Family, de Charles Reisner, con Conrad Nagel, Lewis Stone y Lois Wilson. 1933: Broadway to Hollywood, de Willard Mack, con Alice Brady, Frank Morgan, Russell Hardie, Madge Evans y Mickey Rooney. 1933: The Bowery, de Raoul Walsh, con Wallace Beery, George Raft y Fay Wray. (en) Jackie Cooper en IMDb. ↑ (en) Obituary:Jackie Cooper dies at 88; child star in the 1930s en o diario Los Angeles Times.